WALLACE High School GCSE Religious Studies pupils visited Glendalough recently for a three day exploration of the Celtic monastic site founded by St. Kevin. The group learned that Ireland was once known as the Island of Saints and Scholars. 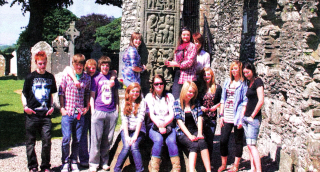 They were led by teachers Paul McCabe and Sara Stevenson and also visited the high crosses and round tower at Monasterboice, Trinity College Dublin and the Vale of Avoca. They saw St. Kevin's country in all its beauty at a site once considered one of the most important locations for pilgrimages in the ancient world.